When something breaks or isn’t working, Aussies say “it’s cactus, mate”. Hence the double entendre of the title, as we had a few issues to address once we got to Bonaire – we were hoping to find someone who could fix our dive compressor which has been out of action since Union Island, and a refrigeration mechanic to look at why our fridge isn’t holding temperature like it used to. We planned to stay for a couple of weeks, so we hoped we had enough time to get parts sent if necessary. But first things first. 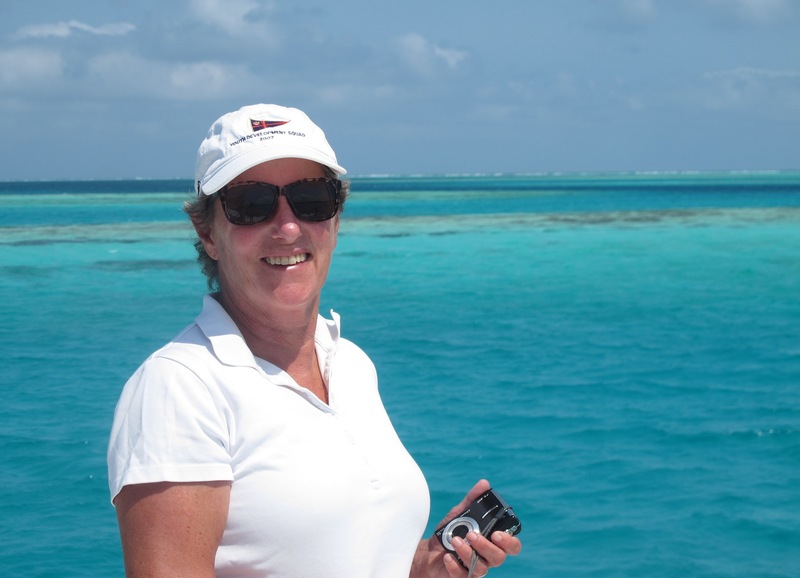 We left the anchorage in Barlovento at 6.30am, with enough light to discriminate the reefs and had a very pleasant sail in light winds. For the first time in many months we were able to put the full mainsail up. I swear I saw moths fly out of the lower section! 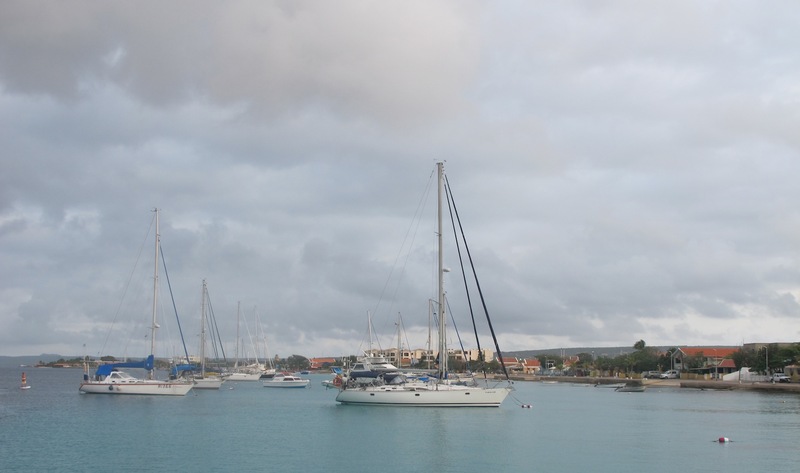 We were sailing pretty much dead downwind (landlubbers translation: wind right behind us) which isn’t the best point of sail for us, but as we approached Bonaire and rounded the southern tip we had a glorious beam reach sail (wind at 90 degrees!) and flew all the way up the west coast to the anchorage off the capital, Kralendijk (pronounced Crawlendyke), arriving mid-afternoon. 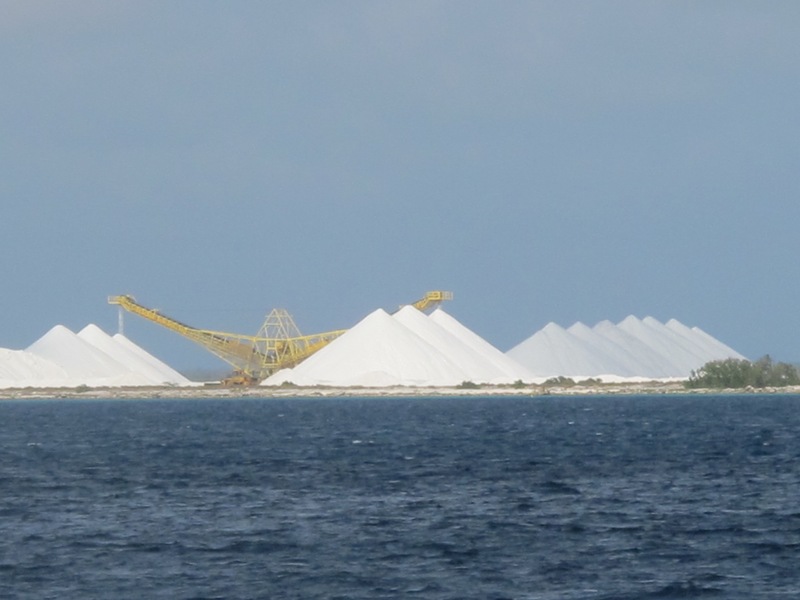 On the way we passed the huge mountains of salt, one of the major exports of the island. 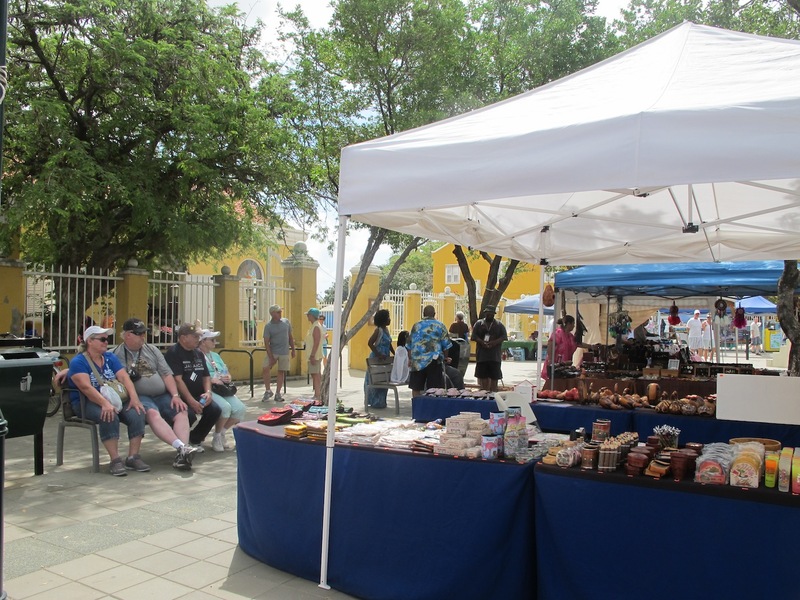 Bonaire is the “B” in the ABC islands, together with Curacao and Aruba. 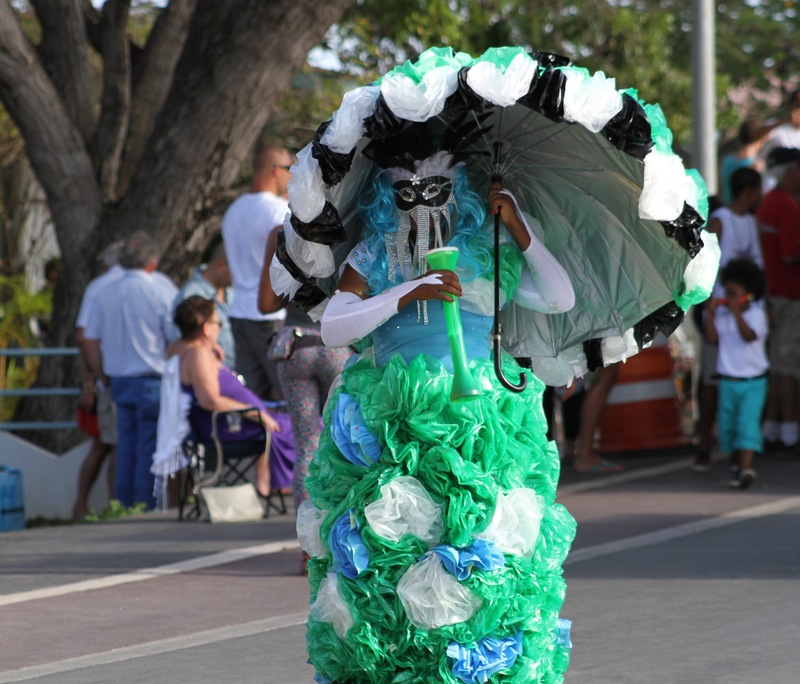 Originally they were part of the Netherland Antilles, but when this was disbanded in 2010, Bonaire chose to be more closely affiliated with Holland and is now a special municipality of the Netherlands. 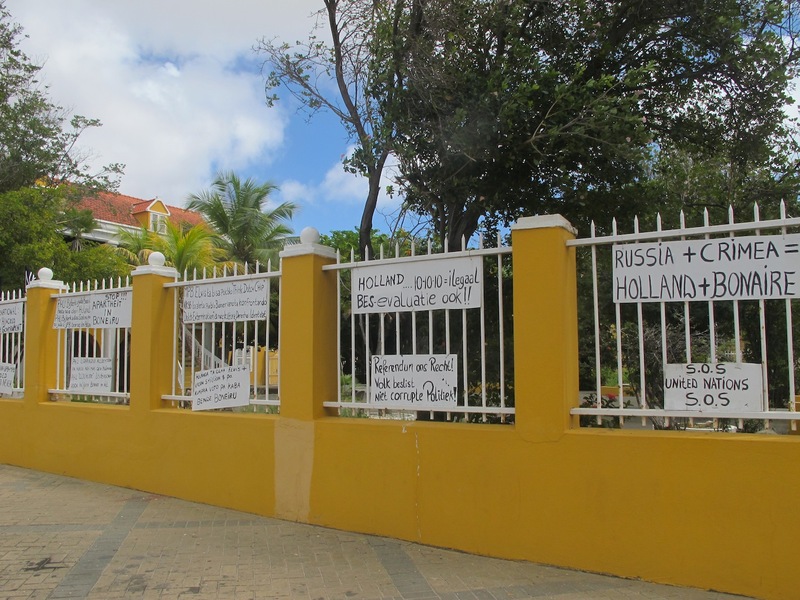 This has been a contentious political issue, and there are obvious signs of ongoing protest and demands for a referendum from some sections of the community, clearly displayed outside the government house in Kralendijk. 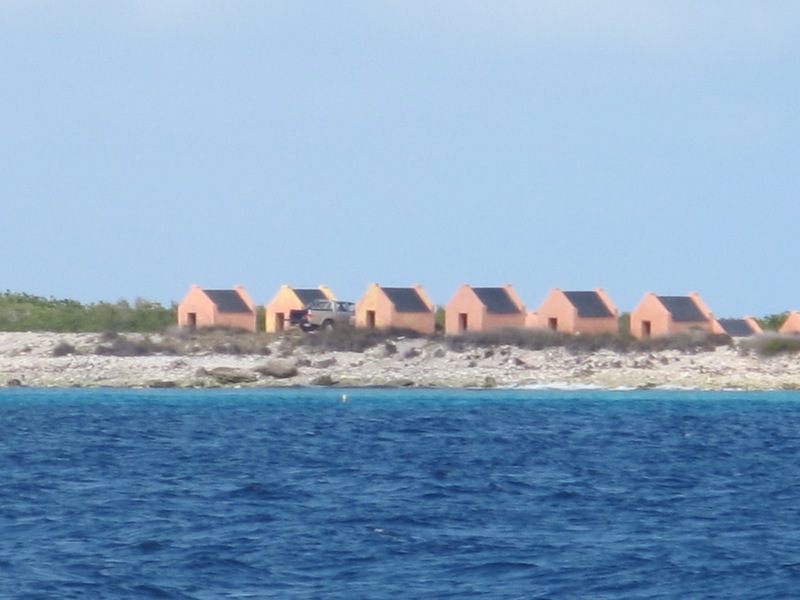 Anchoring anywhere on Bonaire is strictly prohibited in an effort to protect the reef, which is only a few hundred feet from the shoreline. Moorings are available, but not plentiful, so it’s first come, first served. 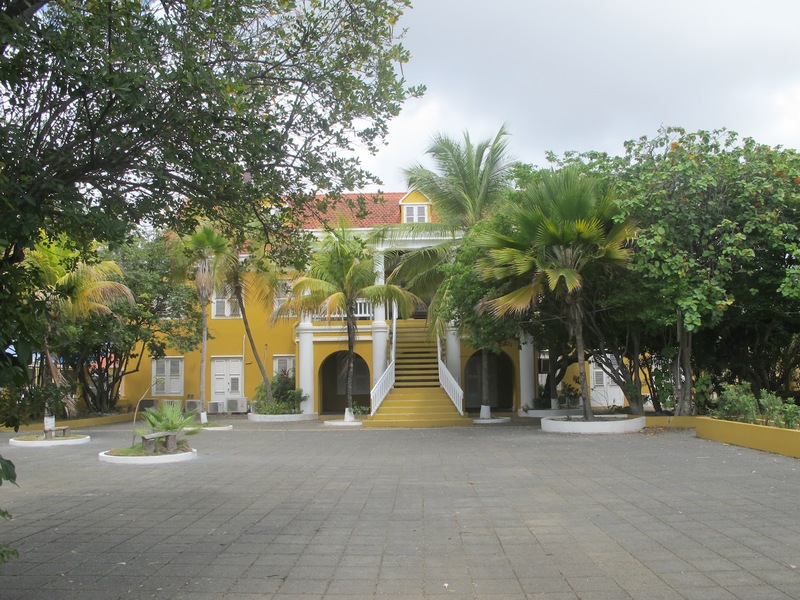 They cost a reasonable US$10 per night, and fees are paid at the marina at the northern end of the bay. 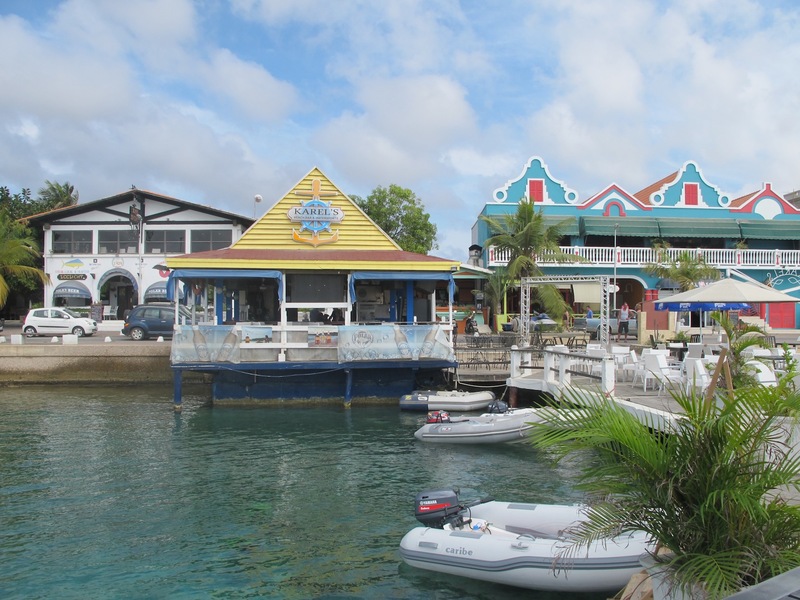 When we arrived, there was only one mooring left, and as we discovered later, way too close to the centre of action, Karel’s Beach Bar. Want to go to a dance party? No need to pay admission, just anchor off Karel’s and you get the full effect of ‘Doof Doof’ dance music until 3am on Wednesdays and Saturdays! In addition, the local pastime is to cruise along the beachfront with your super-duper mega blaster sub-woofers pumping out beatbox ‘music’, preferably at 2 am. There’s also a contingent of bikie enthusiasts who like to do circuits around town, revving their souped-up machines and doing wheelies down the main street. 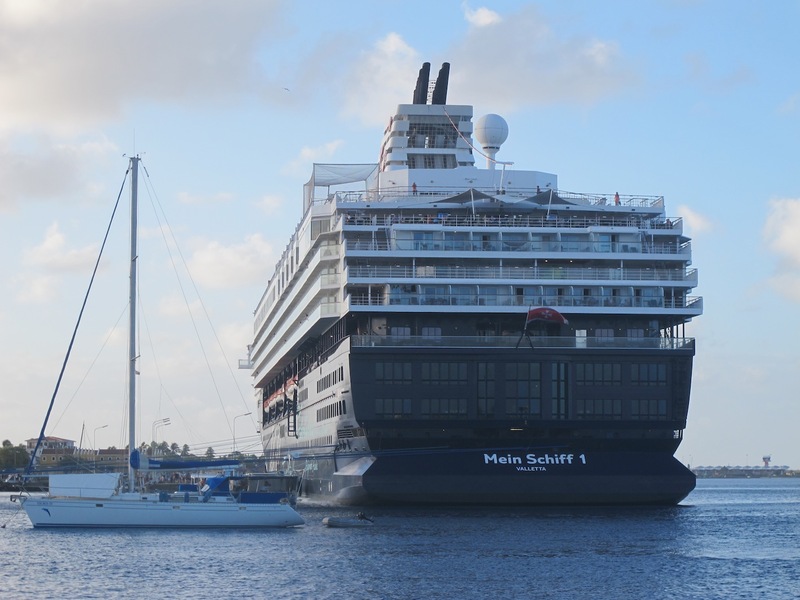 Add to that the constant arrival of huge cruise ships, and it becomes clear that you don’t come to Bonaire for peace and quiet! Cruise ship passengers at the markets, Kralendijk. Don’t they look a happy bunch?! Checking in and out was relatively straightforward, with customs and immigration both situated in the one building at the end of north pier. In previous countries the convention is that only the Captain comes ashore while the crew stay on board. 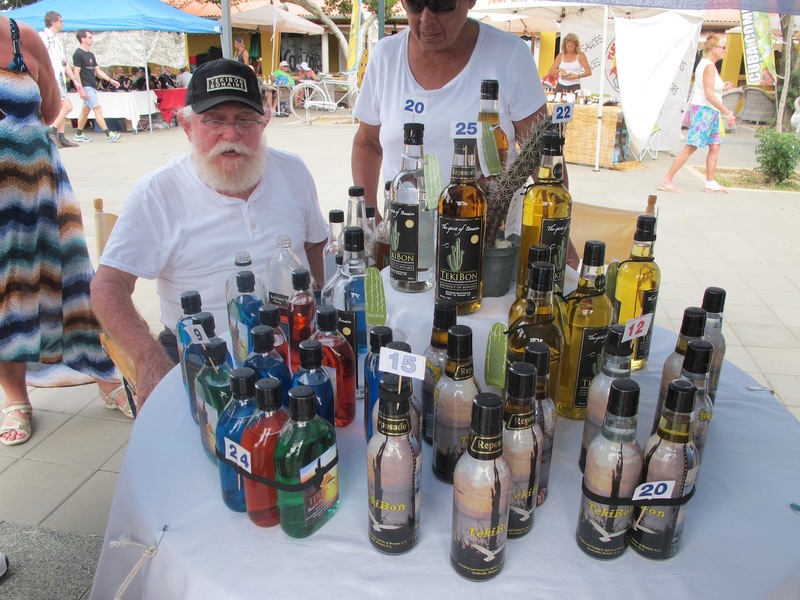 In Bonaire, we were gently admonished for not bringing all the crew with us! It’s hard to know in advance what the requirement are, but the officers were very pleasant and welcoming nonetheless. We’ve found that if you’re respectful and good-humoured it helps a lot with the bureaucracy of form-filling. Being now free to enjoy all that the island had to offer, we contacted Al, a friend of Ed and Carol’s (who we stayed with in Colorado at the beginning of this adventure). 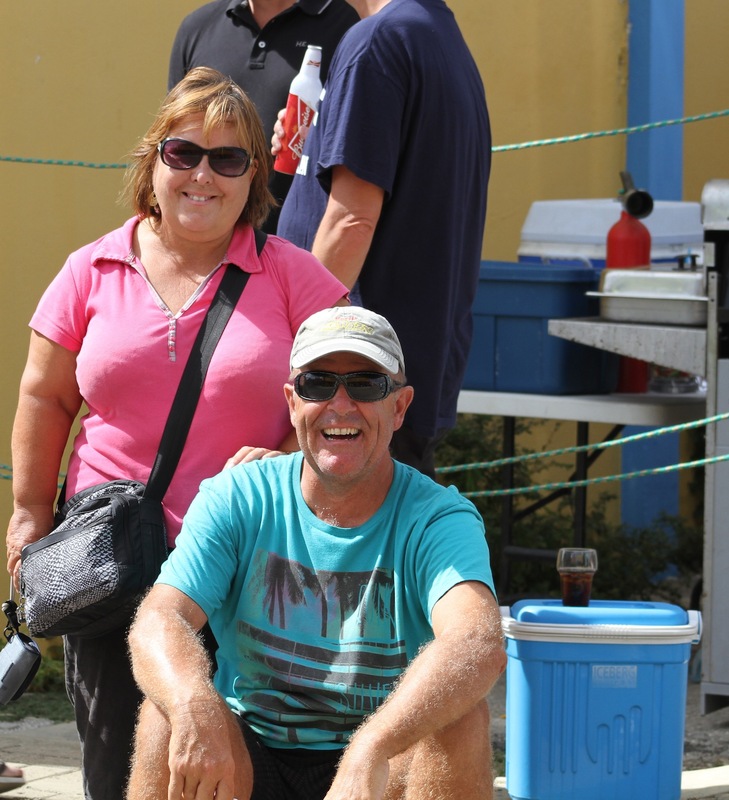 Al owns a divers accommodation complex – “Black Durgon Inn”, and was very welcoming and helpful, pointing us in the right direction for tradesmen and loaning us a pick-up truck for the first week. 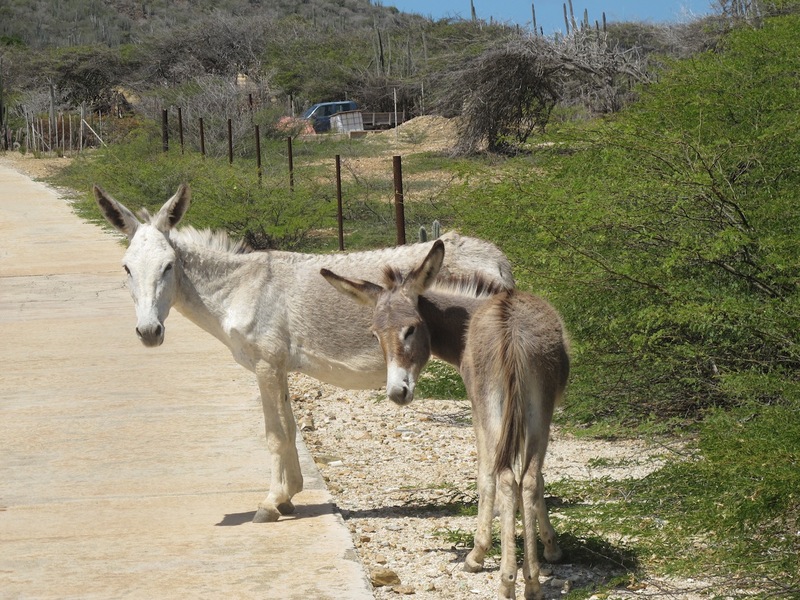 Al is passionate about saving the wild donkeys of Bonaire, who are currently in danger of being culled out of existence and corralled in a ‘sanctuary’ instead of being allowed to roam free. 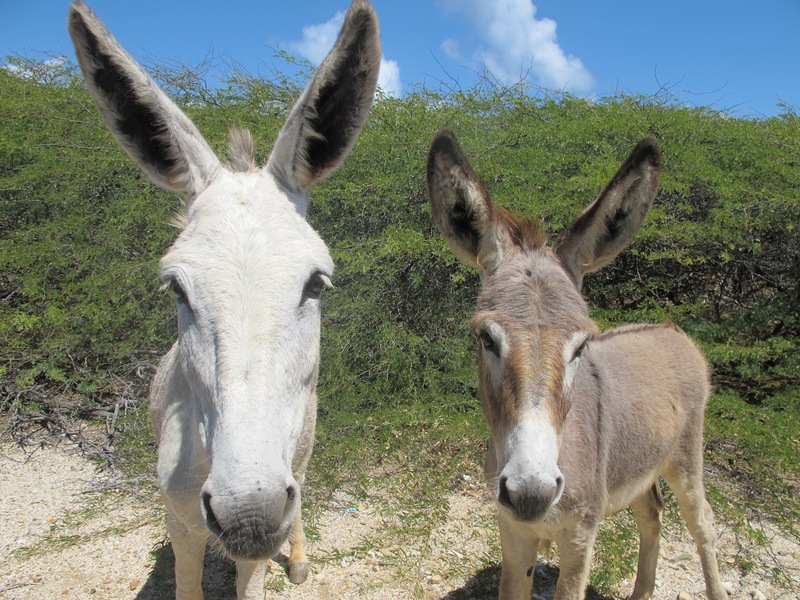 We used his truck to take a trip around the north part of the island, where we saw several donkeys, although I’m not sure how wild these one were – they seemed very happy to stick their noses into the truck looking for food! It’s amazing that anything lives here – it’s a dry, arid, landscape with only 20mm rainfall per year, and all those cacti make you feel you’re in the middle of the Arizona desert rather than on a Caribbean island. Are we really on a Caribbean island?? 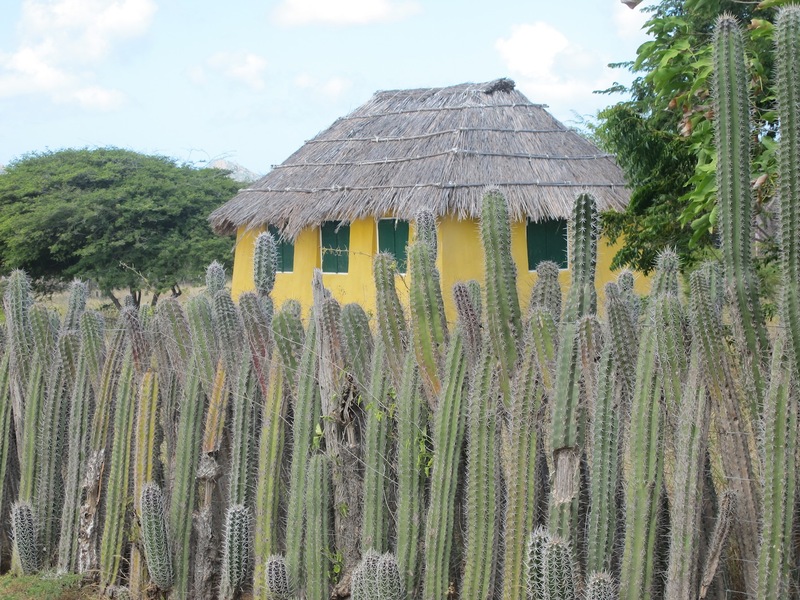 Locals have found some uses for the cacti though – they make great security fences, and there’s even a local distillery making cactus liqueur. 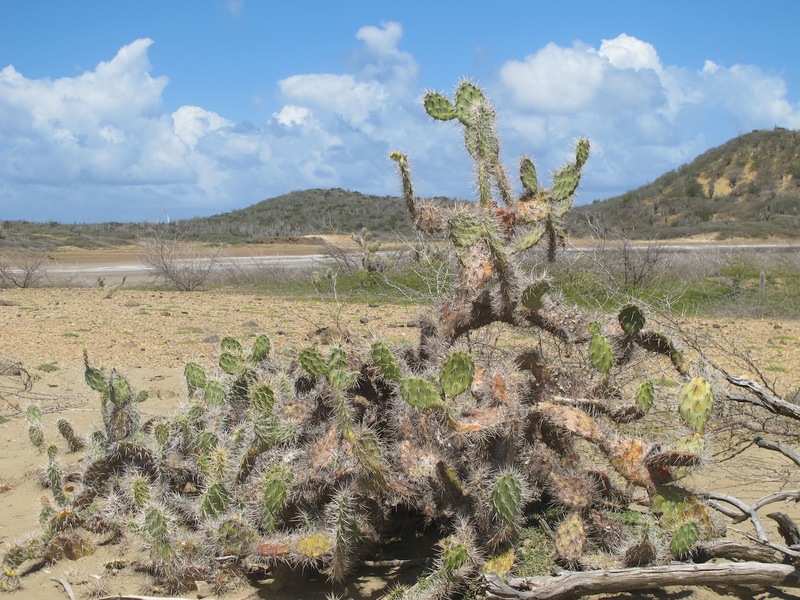 On our trip through the National Park we saw more cacti than I’ve ever seen before – or wish to see again – but we also got to see some beautiful native birds, huge iguanas, and native flamingos that frequent the salt pan lakes on the island. 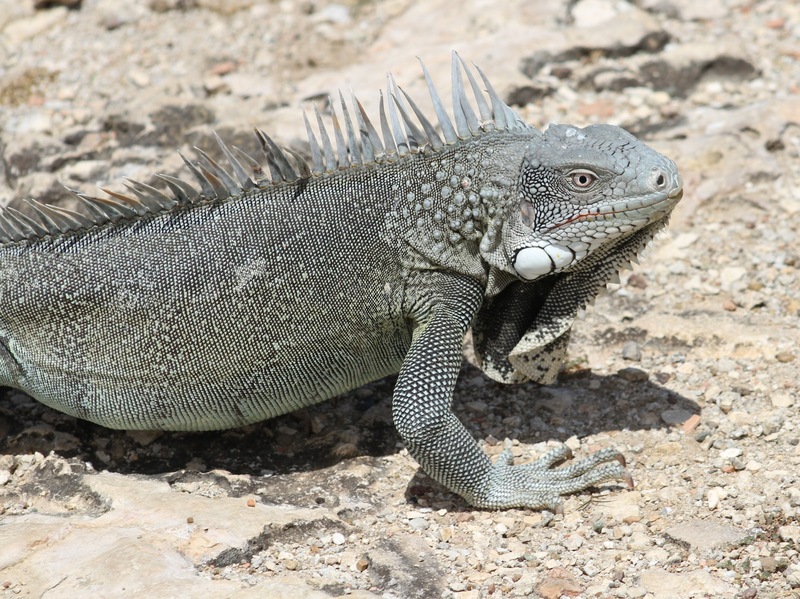 The place is swarming with Iguanas! 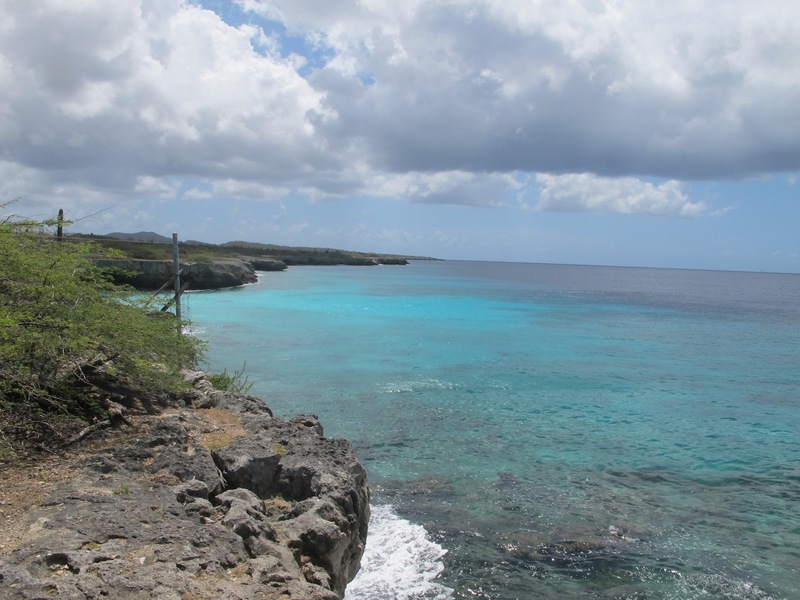 We also got to experience wildness of a different sort during our first week in Bonaire. 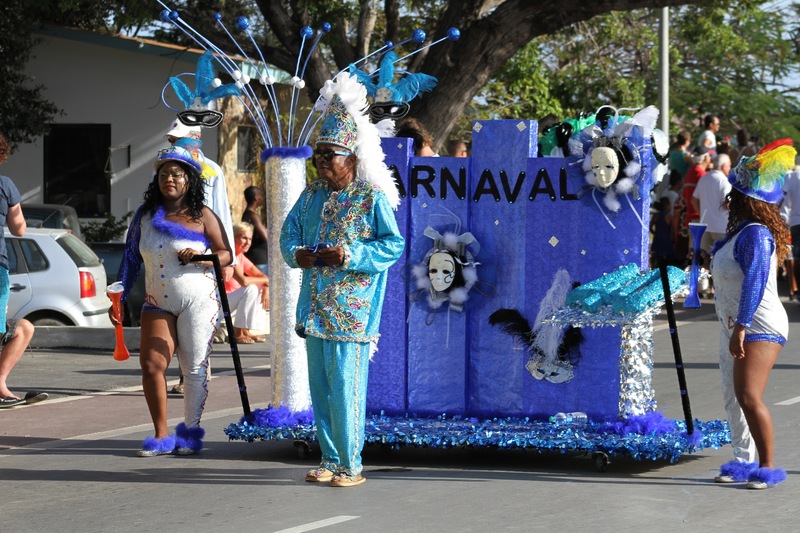 It was Karnivale time (literally ‘the death of meat’, the festival that marks the beginning of lent). 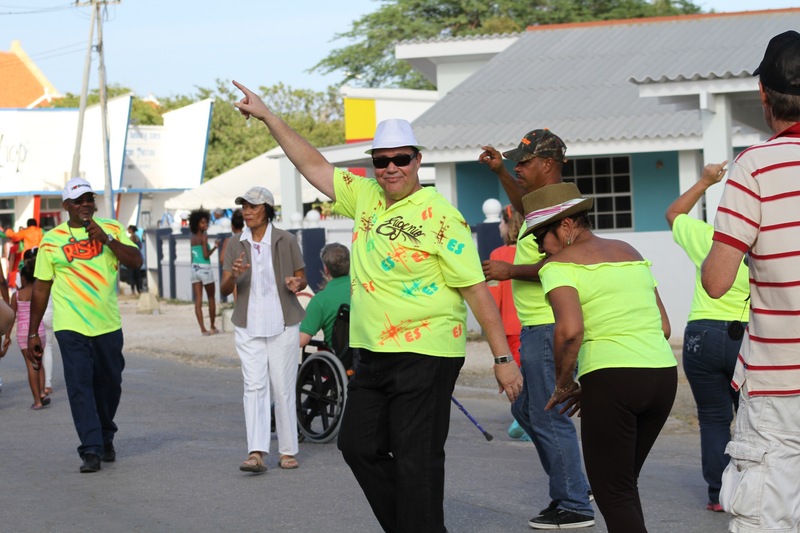 Celebrations go on for days, culminating in the grand parade on Sunday. 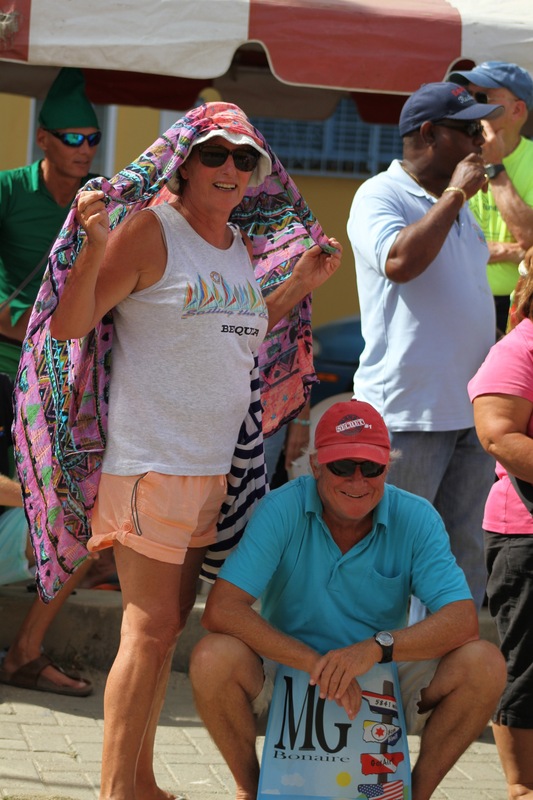 We were told the parade started at 3pm so we found a vantage point and waited…. You know it’s going to be noisy when the kids are wearing earplugs! Obviously there was a very loose definition for the starting time. After a couple of hours of waiting, Team Toucan was beginning to wane and thoughts of a cold beer took hold. While the others went in search of refreshment I walked up to the stadium and found the beginning of the procession. No wonder it was taking so long – every few steps the participants found friends to chat to amongst the crowd and everything came to halt! 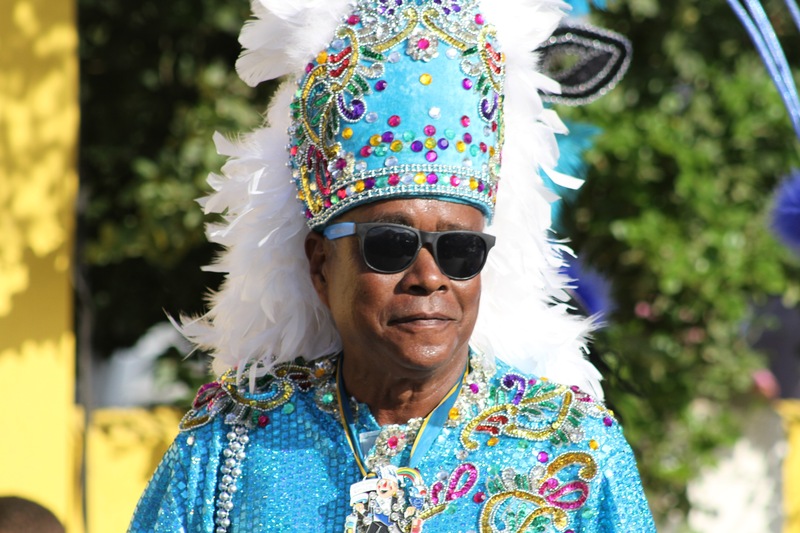 The leaders of the parade – they liked to have a chat to everyone! Sadly the end of our first week meant we also had to say fond farewells to the lovely Mia, winging her way back home to work (boo!). We’ll miss our party girl, and now for heaven’s sake who’s going to keep Sherm under control??!! On a more positive note we’d found Ronald, who diagnosed that the piston on our dive compressor was damaged. A new part had to be sent from Miami, so it looked like we might have to stay in Bonaire for longer than originally planned. 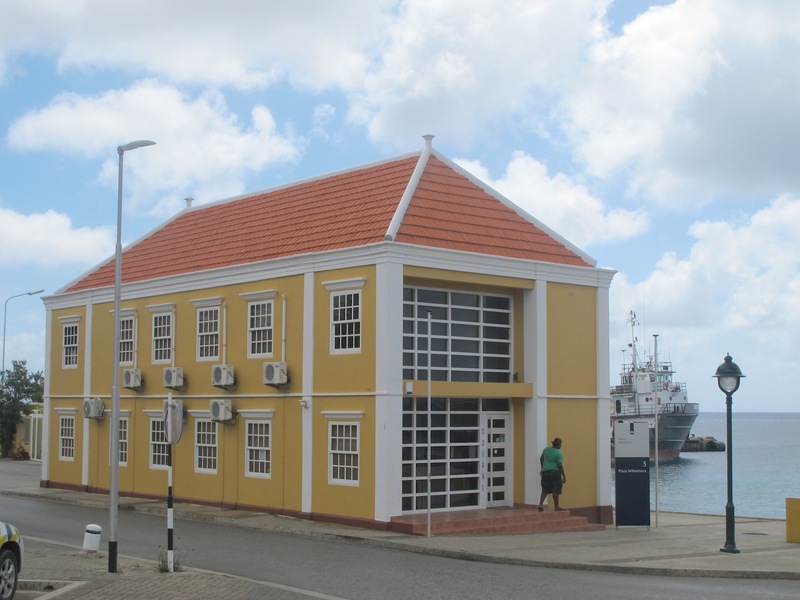 Oh dear, what a shame – that would mean more diving and exploring the southern part of the island! More on that coming up in our next blog. Stay tuned…. From one of the landlubbers; thanks for the translations dear girl – I know what you’re talking about now!! By the way, your photos are terrific.